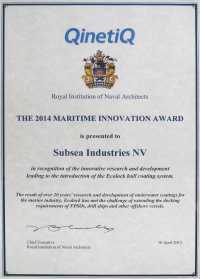 The 2014 Maritime Innovation Award – given jointly by the Royal Institution of Naval Architects (RINA) and technology-based services and solutions provider QinetiQ – has been presented to Subsea Industries for the product Ecolock. Now in its second year, the Award recognisesb outstanding scientific or technological research in hydrodynamics, propulsion, structures and material which offers the potential to make significant improvements in the design, construction and operation of marine vessels and structures. “The maritime industry today is facing many challenges as it responds to the increasing demands of operators, regulators and society for greater efficiency, safety and the protection of the environment. Meeting these challenges will require innovative thinking in all sectors of the industry," said RINA Chief Executive Trevor Blakeley. "However, in an industry which is highly dependent on technology, it is in technological and scientific research and development that innovation will have perhaps the greatest impact, in providing ships and marine structures which cost less to design, build and operate, are safer, and are more sensitive to the environment. “Ecolock is a fine example of the ongoing technological innovation needed to address industry’s challenges of today, and one worthy of the Maritime Innovation Award,” he added.